won a prize at a Butlins holiday camp for them. they'd take it and The Mrs Merton Show as we now know and love it was born. Writing the show, Caroline works with Dave Gorman, Henry Normal and Craig Cash. "It's about fifty percent ad lib and fifty percent stuff that made us laugh in the office." thought that Mrs Merton was a real person, and actually complimented her on her hair. know the questions, nothing's rehearsed, so it's not spoof". 'checkout girl' character from the Fast Show in a recent advert for PG Tips. Caroline's latest project, the sitcom "The Royle Family" was recently broadcast on BBC2. room (it's obviously realistic then!). from characters and not events happening". they wanted to create a character based, realistic but funny, sitcom. 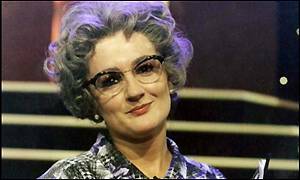 1997 Television and Radio Industries Club Award: "New TV Talent of the Year"
1997 British Comedy Awards: "Top BBC 1 Personality"
Mrs Merton is bolder than Ruby Wax and cheekier than the seven dwarves' bottoms. ... have you ever had a fight with him?" "Oh Come on Chris ...  it's a chat show!" "You're going to punch me aren't you?!" star, but you're still common as  muck!" faster than the other blokes?" "But what first, Debbie, attracted you to the millionaire Paul Daniels?" you know, on a lower budget"
very openly and frank about her work, family and of course, her alcoholism. Family, she realised that she preferred writing narrative comedy.